The regular season’s already started, which means the betting windows are likely closed for most preseason wagers. But in the same way that the sharps’ views on teams’ win totals can establish expectations for the coming year, so too can player prop bets. Better question: Why bother signing a decent-bat, horrendous-glove player like Kubel to a multi-year contract when you already had Gerardo Parra, his Gold Glove defense and greater overall value standing by to work at about 1/16th the price? Bet the under. Chipper’s already said he’s retiring at year’s end, he just had knee surgery (supposedly minor, but his knees have been eating away at his ability for years) and the Braves are in a position where they can contend for a playoff spot, but will need strong contributions throughout the lineup to beat out the eight or nine other NL teams with the goods to play into October. Chipper is an icon and a future first-ballot Hall of Famer, but it would behoove the Braves to a) go get insurance (something they’re already trying to do), and b) cash in that insurance if and when Chipper’s at less than 100%. For the Braves, the difference between postseason baseball and golf could come down to a game or two. They can’t let sentiment hinder their ability to make the right decisions. Did you know that of the 11 highest single-season strikeout totals in the long history of Major League Baseball, all 11 have happened in the past eight years? Did you know that Reynolds doesn’t merely hold the all-time record for strikeouts in a season (223), he’s also number-two (211)? It’s an interesting cause-and-effect question: Did the huge spike in home runs that started in the early 90s and persisted into the mid-aughts happen in part because the old stigma against hitters striking out disappeared? Or did that stigma vanish because working deep counts and taking big swings helped lead to an explosion in home runs? Let’s say a little of both. Then let’s honor Reynolds, who might be the most anonymous record-holder since Earl Webb. The Red Sox scored more runs than any other team last year, and will need to lean on that offense again to surpass pitching-loaded AL contenders like the Yankees, Rays, and Angels. That’s an interesting proposition, given the swings several key players can take in either direction: Carl Crawford could return to his vintage Tampa Bay ways, or see his season blown up by his gimpy wrist. Jacoby Ellsbury could repeat his out-of-nowhere MVP-caliber explosion last year, or return to being merely a very good all-around player. 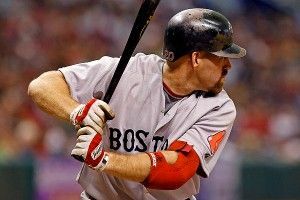 And then there’s Youkilis. He’s never been a particularly durable player, with a career high of 147 games played in a season. But he was also the second-best hitter in all of baseball by wOBA (behind only Albert Pujols) from 2008 through 2010. There’s some major bounceback potential here. The closest thing the Cubs have to a franchise player, Castro’s going to hit, and we could eventually see a power spike with his high-contact, .300-hitting approach, especially given he just turned 22. The bigger over/under for the Cubs will be Castro’s error total. Yes, fielding percentage is a limited stat that was long ago eclipsed by advanced metrics in the public domain and even better measures tracked by savvy front offices. But you can only threaten the lives of fans in the fifth row for so long before your team starts considering you for another position. Hopefully Castro’s miscues can be fixed by tweaking his footwork and mechanics; his bat’s a gigantic advantage for as long as he can handle playing short. Plexiglas! It’s hard to know what to do with the worst year ever recorded by a good player. The end of baseball season is in some ways an arbitrary end point, and it’s entirely possible that Dunn is cooked, and that six months away from regular-season baseball won’t help. But unless you hear about a major, lingering injury, the smart money is on our old friend regression toward the mean. The White Sox roster is stuffed with boom-or-bust players like Dunn (Alex Rios, Dayan Viciedo, Gordon Beckham), making this a sneaky sleeper team is just about everything breaks right. Arroyo was the worst pitcher in all of baseball last year, his plummeting strikeout rate and extreme case of gopheritis teaming up to make him 1.3 wins worse than the typical Triple-A veteran or 25th man who constitutes a replacement-level player. Forget the $13.5 million the Reds owe Arroyo over the next two seasons, or the $15 million more they’ve deferred through 2021. Aroldis Chapman should be in the Reds starting rotation, and Arroyo should be offering guided tours of his house so people can see his Red Sox-era cornrows behind a glass display. Arroyo almost certainly won’t be quite as horrible this year as he was in 2011. Still, it’s infuriating to see a potential contender trot out a batting practice chucker to start real games while better alternatives lie in waiting. Here’s your deep sleeper MVP candidate. Santana walked more than he struck out in his 46-game rookie audition in 2010. Those rates slipped in 2011, as he swung for the fences more and got 27 homers and a .239 batting average for his effort. For much of his minor league career, Santana showed the ability to hit lots of homers, draw a ton of walks and hit for a high average, all at once. Given that the Indians (wisely) plan to give their best hitter ample playing time at DH and first base to supplement his catching duties, Santana could put up beastly numbers if he can consolidate his skills this year. If the Indians make a surprise pennant push past Labor Day, this is the guy voters might point to for that success. That ERA looks ugly, until you remember it’s just one-tenth of a run for every year that Moyer has lived on this Earth. The mere fact that Moyer looks likely to become the oldest pitcher ever to win a game in the big leagues is amazing enough. If Moyer can limit his inevitable high home run totals to mostly solo shots, he could be an effective bridge to a returning Jorge de la Rosa (expected back around June). Given the odds he’s already beaten to get this far, even that might be too modest a projection. Miguel Cabrera might be the best hitter on the planet. That’s not what we’ll be watching for this season. Carlos Lee: Will he be a member of the Astros for the entire 2012 Regular Season? The new Astros brain trust has already shown it can bag a promising prospect using mere spare parts, a great skill to have when you’re attempting baseball’s biggest rebuilding job. Lee makes $18.5 million this year and isn’t nearly the middle-of-the-order masher he once was. But eat enough salary, get one desperate-enough buyer and…stranger things have happened. All but two of the Royals’ props are hitter-based, with Sanchez at nine wins and Luke Hochevar at 10½the lone pitcher bets. This is as a good a sign as any that the Royals should be fun to watch on many nights, but also sorely lacking impact arms at the major league level. Runs scored are a team-dependent stat, same as wins, saves, RBI, and other numbers that you should mostly ignore for non-fantasy purposes. But in Reyes’ case, his ability to score 101 or more runs serves as a pretty good barometer of health, and by extension, his value: In the four seasons in which he’s scored 101 or more runs, Reyes has averaged 150 games played and 6.1 Wins Above Replacement. In the three seasons in which he’s scored fewer than 101 runs (since becoming a full-time big league starter), Reyes has averaged 110 games played and 2 Wins Above Replacement. If the Marlins get the healthy, six-win version, they might very well win the NL East. After multiple complaints about his projected playing time and more importantly a sharp decline in his skills over the past few years, the Angels looked ready to make Abreu someone else’s problem, negotiating a deal that would have sent him to the outfielder-starved Indians. That deal quickly fell apart, and Abreu is still an Angel. Hopefully the Halos have the good sense to shove Abreu aside (and maybe take away playing time from OBP-sieve Vernon Wells too) the minute they feel superprospect Mike Trout is ready to play every day in the majors. There’s an excellent chance that Ethier isn’t a Dodger at this time next year, regardless of which side he lands on this over/under. If injuries again sap his power and knock him out of the lineup for long stretches like they did last year, the now incredibly well-heeled owners will look for a better alternative. If Ethier returns to the form he showed in 2009 when he launched 31 homers, he might command a price high enough to make those owners say, screw it, let’s go get Cole Hamels (or Matt Cain, or Mike Napoli, or all of the above) instead. Greinke led all starting pitchers last year in strikeout rate as well as xFIP. The 2.16 ERA and 9.3 WAR he posted in 2009 might be a stretch, but you have to figure the gap between Greinke’s advanced stats and traditional stats should shrink dramatically sooner or later. Back the under here. Target Field opened two years ago. Mauer’s hit exactly one home run at home since then. We might end up remembering his 28-homer campaign in 2009 the way we do Brady Anderson’s random 50-spot. If you’re a Mets fan, you’re rooting hard for Santana to blow past that number by the All-Star break, if not sooner. Not because that would mean the Mets will have a shot at winning the NL East (too many holes, too many strong rivals), but because it might just convinced some aggressive, pitching-deprived team to work something out for a guy who was the best pitcher in baseball in his prime. Sure, his prime ended six years ago. Yes, he’s owed $55 million over the next two seasons, 2014 buyout included. But again, stranger things have happened. Should Nova even be in the Yankees’ starting rotation? Given the events of January 13, and Nova’s uninspiring peripherals, tossing last year’s 16-game winner into the pen might make sense, either now or in the relatively near future. The man who will single-handedly make the A’s an interesting team to watch could crush that number, if his natural talent helps him overcome his can’t-walk-off-the-island batting eye. Too bad we can’t pair this home run prop with a “swings at a pitch that hits the dirt, clubs it to right-center for a double” bet. Vladimir Guerrero would approve. Odd that the sharps don’t have quite the same faith in Pence’s potential stardom that some others do. Even odder to see a long list of Phillies props, and not a single Chase Utley or Ryan Howard bet among them. but still). Maybe the more apt over/under here would have been Casey McGehee, over or under 400 at-bats. Unlike with Carlos Lee and Johan Santana, where you’ve got players well past their prime and making gobs of money, Street has an affordable $8 million left in the final (guaranteed) season of his three-year contract, and he’s been a good to excellent short reliever from the moment he put on a big league uniform. The Padres might be a little better than people expect this season. They should still pursue veteran-for-prospect deals if they’ll help the team in the long run. Dealing Street would be at or near the top of that list. Brian Wilson: Will he shave his beard completely during the 2012 Regular Season? Are we sure he hasn’t been Between Two Fernsing us all along? Figgins might hit the Over and still repeat as the worst third baseman in the game. Oh, what some teams would do if granted NBA-style contract amnesty. Over. You can take the don’t bet on playoff heroes thing too far. Breakout coming for Mr. Freese, and a possible return to the playoffs for the Pujols-less Cardinals. I’m posting this Hellickson line here to highlight the fine work done by Mike Salfino and Bradley Woodrum on strikeout rates. Yes, eyeballing a pitcher’s K rate is one of the best ways to predict future results, even (especially!) when past ERA and win totals haven’t impressed. But as with just most baseball matters, it’s worth digging a little deeper to find another layer of detail. Read Salfino and Woodrum, then don’t be surprised if Hellickson posts a strong follow-up to his Rookie of the Year campaign. I don’t know, you don’t know, and the Rangers don’t know, even after Darvish painted the corners like Paul Klee this spring (screw you Picasso, I’m tired of everyone using your work to represent the highest forms of art). With Neftali Feliz’s health a bit of a question mark, Mike Napoli ripe for regression, a few other Rangers question marks, and the Angels loading up this offseason, Darvish’s debut season may well decide the AL West. A much more reasonable estimate than what fantasy players seem to expect out of Lawrie, given how high he went in drafts and auctions this month. You can understand the enthusiasm, though, especially among Jays fans. It’d be nice to finally ditch the old team slogan: “Toronto Blue Jays — Hey, at least we’re not the Leafs”. Nats general manager Mike Rizzo have made it clear that Strasburg will be on an innings limit of 160 this season. As mentioned earlier, Zack Greinke led all qualified starters last season with a strikeout rate of 10.54 per nine innings; that translates to 187 strikeouts over 160 innings. So this line reflects a belief that Strasburg will either lead the league in strikeouts (or come damn close) in his first full year as a major league starter, while still ramping up to full strength after 2010’s Tommy John surgery. No pressure. If Strasburg does dominate to that extent, the Nationals might very well find themselves in the thick of the pennant race, which would severely test Rizzo’s resolve as he decides whether or not to go a little further with his potential ace.